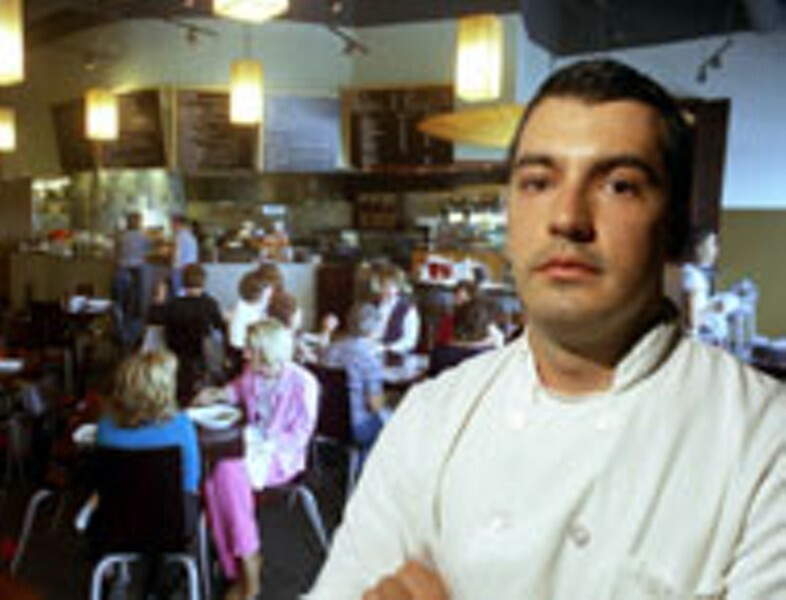 Frank Kaltsounis was born with the restaurant business in his blood. Kaltsounis, along with brother Angelo Kaltsounis and friend Stratos Lambos, maintains the status of chef/owner of Ilios Noche. Aside from his title as pastry chef and part owner, he's just 25 years old, humble about his success thus far and with no plans on slowing down anytime soon. "I chose this as my career," explains Kaltsounis. "I didn't just fall into it. I want to work hard to do whatever I can to be successful in it." Raised in Charlotte, Kaltsounis learned what it takes to make a restaurant work from his father, owner of the Landmark. It was after seeing Angelo graduate from the Culinary Institute of America that Frank knew he would follow in the family footsteps. He attended the French Culinary Institute in Manhattan and while doing so worked at Aureole with his brother and Lambos. "I worked there basically for free. They were like, if you want to work here, that's fine, but we aren't going to pay you. It was one of those prestigious restaurants at that time where you were lucky to get in. So I was lucky to have the experience." Upon graduating, Frank returned to Charlotte and worked for Dean and Deluca as an entry level pastry chef; he also had the opportunity to work as assistant pastry chef to Kegan Gehard. "I learned so much from him," he confesses. "You learn the basics at school, but where you become good is who you work with." Two years later, at only 20 years old, Frank left Dean and Deluca when he was hired on at Bonterra as executive pastry chef. There, he was calling all the shots. "It was an awesome place to work; they helped me with whatever I needed and never held me back." His culinary talents were summoned again when, one year later, the Buckhead Life Restaurant Group in Atlanta called on him to help them with a Greek dessert menu. They were so impressed, he was convinced to stay and sign on with the company. While in Atlanta, Kaltsounis worked as the pastry chef for Bluepoint and Kyma and gained experience in the aspect of fine dining by working in a "hot spot" that was often frequented by celebrities. Throughout his time in Atlanta, Kaltsounis and Lambos, who was also cooking in that city, knew the plan was to move back to Charlotte and open a restaurant of their own. "Professionally, working for Kyma was probably the best experience I have had. Working for that company, they always said that the service for the customer doesn't start when they walk in, it starts with the valet. There was no substitute for excellence and it was the best or nothing." After two years in Atlanta, Frank moved back to Charlotte and immediately began looking for a location to open a restaurant. The Kaltsounis brothers and Lambos spent nearly a year of planning the Greek and Italian menu and perfecting the concept and opened Ilios Noche (day and night) in late November 2003. "It's a very big change, going from a chef in a restaurant to someone in a management position to opening a place. I am still the happiest when I'm in the kitchen." For Frank, one of his many specialties in the kitchen is ice cream. "Ice creams are so cool because no matter what, if somebody has had a bad meal or is in a bad mood, they are always going to love ice cream. It's fun to give them something that they don't expect." According to Lambos, "No one has seen what Frank can really do. I mean that seriously. He has an amazing talent." When not at the restaurant, Kaltsounis is a huge sports fan and enjoys going out with friends and spending time with his family. "Everyday is a new adventure in this business," he enthuses. "We don't want to stop at one restaurant; we want to keep opening more. The three of us are a strong team and very versatile. Who knows what the future will bring?" Ilios Noche is located at 11508 Providence Rd. It is open from 9am until 10pm Monday through Friday, and Saturday 9am until 11pm. Phone: 704-814-9882.